Three short films compose the movie. Each segment is freely inspired by Tokyo and shot in the heart of the city. "TOKYO!" is a symphony interpreted in three dissonant parts, reflecting the image of the metropolis. He is a hikikomori - like many others in Japan, he has withdrawn from all contact with the outside world. When the pizza delivery girl faints during an earthquake, the unthinkable happens - the man falls in love. Will he take the unimaginable step : leaving the dead security of his apartment for the streets of Tokyo ? non sibi Apr 03 2011 9:54 pm lunapark6 --> thank you for your review, I just watched the 3rd segment, Shaking Tokyo, it was not an easy watching. tsa - comment #5 --> what is wrong with you? Ki May 24 2009 2:21 am “Tokyo!” is a three part anthology film centered around the city of Tokyo and interpreted through the vantage points of three non-Japanese directors. Obviously the attraction for myself is watching Korean director Joon-ho Bong work with Japanese actors Yu Aoi and Teruyuki Kagawa. 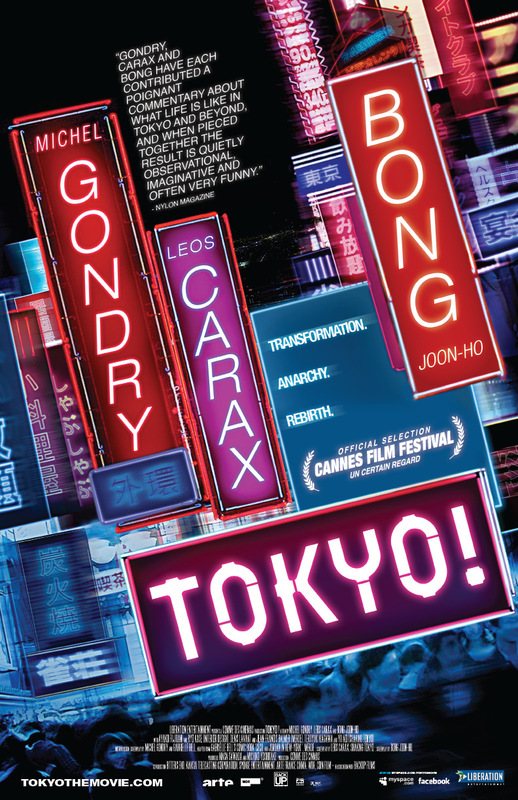 “Tokyo!” also features two well known French directors, Michel Gondry (Eternal Sunshine of the Spotless Mind) and Leos Carax (Boy Meets Girl) as they bring their own distinct viewpoints into play. While the segments are not related besides a common setting, each director brings up different viewpoints of Tokyo that converge and diverge like the busy cross-walks of Shibuya. First segment "Interior Design," directed by Michel Gondry, stars Ryo Kase and Ayako Fujitani as a young couple moving to the big city of Tokyo. Although Akira (Ryo Kase) is an aspiring filmmaker who knows what he wants, his girlfriend doesn't have such clear plans. With each passing day in Tokyo she finds herself losing confidence in herself and questioning the motives of those around her. This segment also features Satoshi Tsumabuki, Ayumi Ito, and Nao Omori turning in fun to watch supporting performances. If you keep your eyes wide open you may also spot somewhere director Shunji Iwai making a cameo appearance. Gondry's "Interior Design" turns out to be an engaging story that can easily stand on its own as feature length film. The story initially brings to light the cramped feelings of living in Tokyo, marked by its tiny apartments and crowded streets. 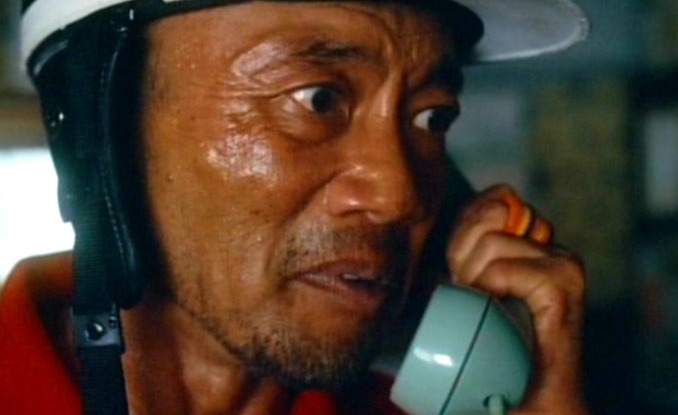 The feeling of "sinking" then overtakes the film as Akemi's emotional crisis takes center stage. The film then takes an unexpected Kafkaesque turn with Akemi experiencing a metamorphosis of the wooden chair kind. A wonderful segment highlighted by the ace performance of Ayako Fujitani and the deft direction of Michel Gondry. 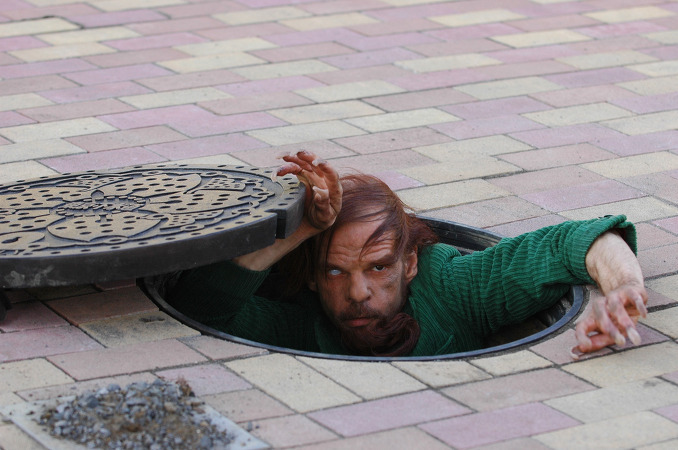 Second segment “Merde,” directed by Leos Carax, stars Denis Lavant as Merde – a creature that lives in the sewers of Tokyo, who comes out to terrorize the citizens of Tokyo like a modern day Godzilla. After Merde goes on a mad killing spree he is apprehended and set for his day in the Tokyo courts. Merde speaks a language that no one else seems to understands, except a prominent French lawyer (played by Jean-Francois Balmer), who comes to his defense. "Merde" starts out with a bang with Denis Lavant making a splash literally and figuratively. As he makes his way through the streets of Ginza your curiosity is piqued as you wonder where the story will lead. Unfortunately, the story turns out be complete garbage as Carax takes a patronizing view of Japanese society told from the viewpoint of an all knowing sentient. In what turns out to be a portrayal similar to a sympathetic portrayal of the Colombine kids in the U.S., the anti-hero Merde is propped up to be a carrier of the truth as he holds a mirror to Japanese society. I would reply that mirror when reflected off a secondary mirror probably tells a whole lot more about the truth. The short film also suffers from way too much self-indulgence as the lengthy interrogation and court room scenes goes on and on. Final segment “Shaking Tokyo,” directed by Jooon-ho Bong, stars Teruyuki Kagawa as a reclusive “hikkimori” (a person who never leaves his home). 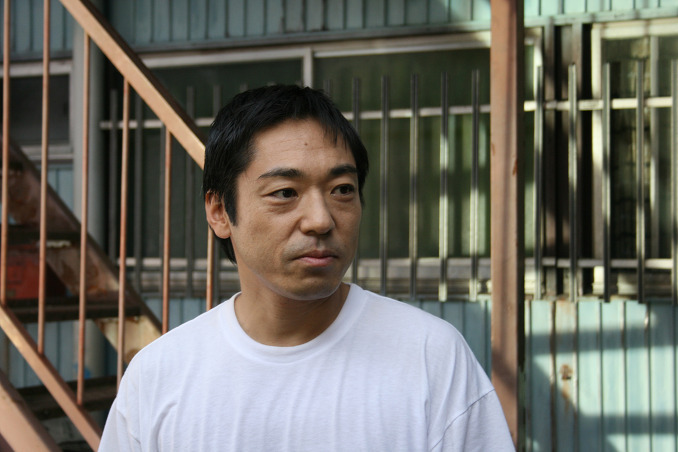 Kagawa’s character hasn’t left his apartment in over ten year and he survives off the money sent by his parents and orders made via telephone. One Saturday, Kagawa receives his usual pizza delivery and is surprised to find a spunky delivery girl (played by Yu Aoi) standing in his doorway. Suddenly & metaphorically, an earthquake strikes Tokyo and the pizza delivery girl collapses on Kagawa’s floor. While waiting for the girl to recover Kagawa starts to feel love for the first time. Similar to Gondry’s “Interior Designs,” Bong’s “Shaking Tokyo” is highly entertaining and would certainly make for a compelling full length film on its own. 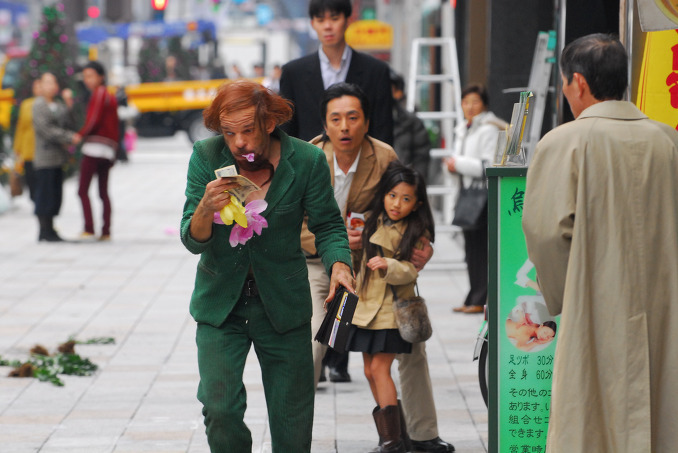 While Gondry’s “Interior Designs” expounded on the crampness found in Tokyo and how it leads to a sense of alienation, Bong takes up the opposite spectrum of open space and how that can also lead to alienation. The obsessive compulsive traits found in Kagawa and his apartment is done to perfection, the soundtrack is highly engaging, and Yu Aoi probably has no more than 5 minutes of screen time, but makes every single second count. On the strength of Gondry's "Interior Designs" and Bong's "Shaking Tokyo" the omnibus "Tokyo!" is a film you should seek out. Of course you do have to sit through the cruft known as "Merde," but you can just as easily hit skip on your dvd player. One last note, from Sophia Coppola's excellent "Lost in Translation" to the omnibus film "Tokyo!" the themes of alienation & isolation seems to have become a prominent trait associated with the city of Tokyo - at least from the view point of westerners. From my own limited time spent in Tokyo, I find it surprising that the nearly infinite amount of other interesting aspects of Tokyo are not represented more. From those quirky otaku folks in Akhibara, to the out there kids in Harajuku, to the glamorous life found in Ginza, to the almost unnaturally clean state of the city itself there's so many aspects of Tokyo to be tackled, but again we're given the same themes of alienation that's not even unique to Tokyo. In fact, as soon as you take yourself to another largely homogeneous country that speaks a foreign language well that feeling of alienation will likely come about again. The question then becomes are you going to make an effort to assimilate? Raku Oct 22 2008 10:05 am I enjoyed it, they were smart to put the movies in this order. But "Merde" could have been 15 minutes shorter. RamenLover Aug 12 2008 11:45 am I'm eagerly anticipitating this film as well. Joon-Ho Bong directing Yu Aoi -- worth price of admission right there. Raku Jul 31 2008 8:03 pm arrgh i can't wait to see this!